JOHANNESBURG, (DNA) – Opening batsman Imam-ul-Haque smashed a half century to help Pakistan equal the ODI series against South Africa on Sunday. Earlier, Hashim Amla and Faf du Plessis added 101 for the third wicket, but Pakistan struck quickly on either side of their stand with Usman Shinwari starring with 4 for 35 to bowl the hosts out in 41 overs. Green Shirts won the toss and opted to bowl first as they aimed to end Proteas’s unbeaten PinkDay record at the Bidvest Wanderers. As the match kicked off, Pakistan won the toss and opted to field first. Opener Hashim Amla racked up 59 runs before being bowled by Imad Wasim. Skipper Faf du Plessis was caught out at 57 by Muhammad Hafeez off a delivery from young Shadab Khan. South Africa is leading the five-match series 2-1 after they beat Pakistan by 13 runs according to the Duckworth-Lewis-Stern method in the rain-hit third ODI at SuperSport Park on Friday. Rain is expected in Johannesburg, and could once again play spoilsport today. Sarfraz Ahmed is not playing today’s game after being suspended under anti-racism code of the ICC’s Code of Conduct. Shoaib Malik is leading the Pakistani side and Mohammad Rizwan has replaced Sarfraz as wicket keeper. 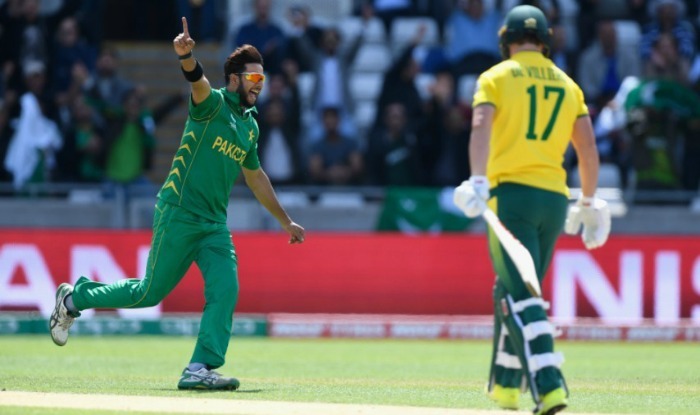 The regular skipper, Sarfraz has been left out after his controversial comments involving Andile Phehlukwayo during the second ODI last week. He faces a four-match ODI ban.